I suppose you could say we’re confident. (laughs) We’re confident every year. It’s impossible to know how things will pan out. But we’re optimistic. 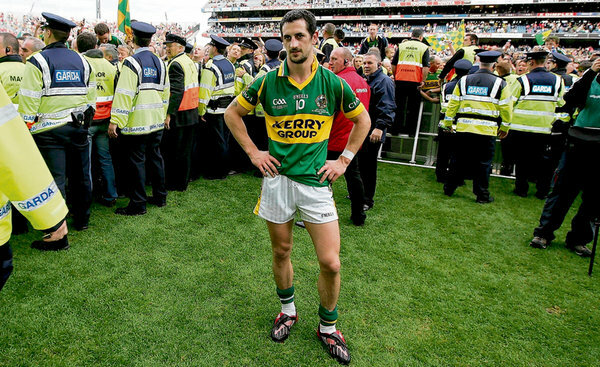 Kerry are reigning champions. Where do you see the biggest threat to your title coming from this year? Well, Cork are obviously the hot favourites. They’ve made no secret of their ambitions and they’re the team to beat. The Dubs have changed tack. They look a more savvy bunch this year. They’re more defensively minded, more aggressive. And Tyrone are definitely going to be back there with another sting in the tail. Read the rest of this article here. London Grime Scene,fashion tv, Christopher Bailey for Burberry…..??!!! Whats happening to the GAA? Read between the lines… only place you’ll find Mayo. I suppose you could say we’re confident [about facing Mayo]. (laughs) We’re confident every year [when Mayo are playing]. It’s impossible to know how things will pan out [but it’d be a pity not to have an easy matchup in Mayo]. But we’re optimistic [that Hardy Bucks gets a tv series]. Jaw dropping detail by Galvin in the fashion stakes. Only noticed he was posing like a model in the photo you used after reading the article. My mind is blown.